10. Wildfire: Mendocino Complex, Mendocino and neighboring counties, California (after) &nbsp; &nbsp; &bull; Year: 2018 &nbsp; &nbsp; &bull; Fatalities: 1 &nbsp; &nbsp; This fire complex, consisting of two adjacent fires affecting four California counties, is still burning, though it is mostly contained. Thus far it has burned more than 422,000 acres and destroyed more than 275 structures. 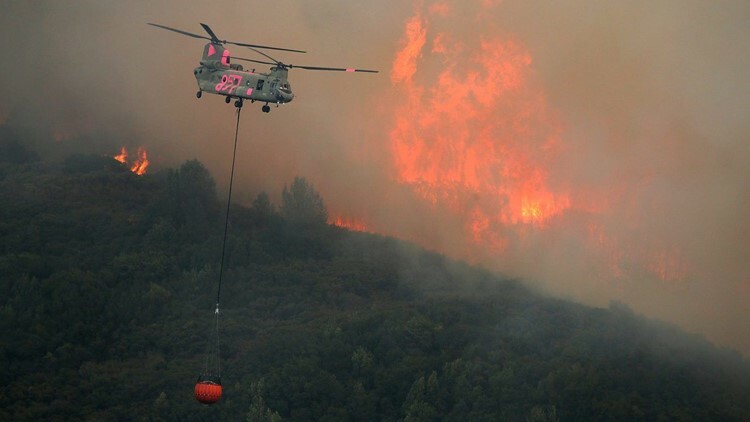 It is the largest wildfire in California history. Some readers think we're clueless. We said Verizon Wireless should ditch "throttling" the service of customers who go over monthly limits and come up with a better way of making money than upsetting customers. Many wrote in to say: Verizon is a business and is in it to make money. We still think there's a better way. Verizon Wireless' decision to "throttle" a California fire department's cellphone service as it tried to put out a massive fire got the company in hot water. Verizon apologized, saying that it was a customer service error and that there would be no throttling of first responders. Throttling is what wireless carriers do to customers who go over the monthly agreed upon data allotment – slow their service down to a crawl. We said we didn't think it was a good business practice, a way to keep customers happy, especially when the service is billed as Go Unlimited, Beyond Unlimited or Above Unlimited, and Verizon says, "Never worry about data charges on your bill again." There is hidden fine print: "During times of congestion, your data may be temporarily slower than other traffic (only after 22GB/mo on Beyond Unlimited or 75 GB/mo on Above Unlimited.)" Verizon spokesman Rich Young wrote in to say this is how Verizon handles congestion on its network. "If a customer is on a busy cell site and they have also reached their monthly allotment of high speed data ... their data traffic may be put behind other traffic on the network. This happens only in times of congestion." He insisted that consumers are less likely to be throttled on Verizon than on competitors' services. "When you think about the number of times a customer is likely to be network managed on our network vs. throttled on another, you’re much more likely to have a better experience with Verizon than on any other carrier," he said. I have an idea for YOU, Jefferson. Don’t put so many ads on your site. It looks trashy. Are you a writer or an advertiser? You should give away all your work for free without ads. I’m sure you’ll be able to stay employed using the same logic you throw at Verizon. On Twitter, reader Chris Schaeffer suggested that USA TODAY discontinue running ads on our site. "You should give away all your work for free. ... I'm sure you'll be able to stay employed using the same logic you throw at Verizon." On Facebook, reader Todd Steinbrueck said Verizon had a right to make a profit from heavy users. "Verizon's policy is stated upfront plain and simple. If you want to dine out, and you chose an all-you-can eat buffet, do you think they are going to kick you out at midnight after you have been there for 10 hours?" Others noted the Santa Clara County Fire Department was at fault as well. It complained about being throttled three times in the past year by Verizon. So why didn't it just switch carriers, which is the solution we suggested in our weekend piece? The Santa Clara County Fire Department, "knowing they were going to need extra data for emergencies (plenty of California wildfire examples to get data from) could have raised their limits permanently to cover all their needs all the time," wrote Michael Robertson on Facebook. "Verizon has to pay someone else for using their data lines, so it isn't free. Verizon is a business and should not be forced into acting like a charity. All that does is drive up costs for regular consumers. Verizon could do what banks do and give companies and consumers the option to go over their limits without throttling, and just charge them an extra fee on the times they do, which would encourage them to regulate their usage better. If you purchase 22 gigabits/month and really need 45 gigabits/month sometimes then buy 45." Rival AT&T pitches the FirstNet alternative, which it said is built for first responders. It doesn't have data caps. For the rest of us, T-Mobile and Sprint said they won't throttle you until after you use 50 GBs of data, to the 22 cited by Verizon and AT&T. Apologies aside, it's doubtful the throttling issue is going away soon. Readers — ready to chime in? I'm on Twitter, @jeffersongraham.